Connect the Vision Sensor to the computer using a Micro USB Cable. NOTE: The Vision Sensor does not need to be connected to the V5 Robot Brain. NOTE: The V5 Robot Brain does not need to be connected to the computer or turned on for this process. 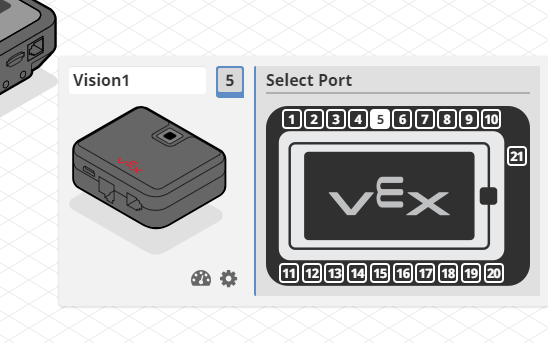 Start a new project in VEX Coding Studio and drag out a Vision Sensor from the frame on the left into the Robot Configuration Pane. 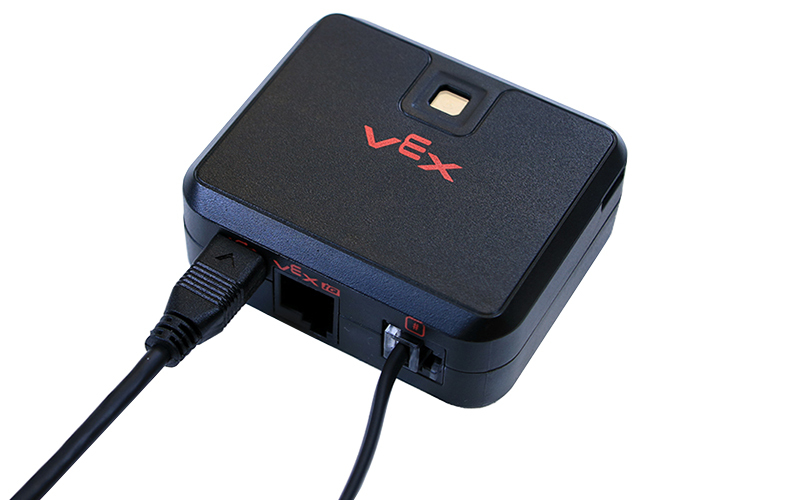 Select the port that the vision sensor will be plugged into on the V5 Robot Brain and then click on the cog icon to launch the Vision Utility. Place an object in front of the Vision sensor so that it takes up most of the screen and click on the 'Freeze' button to lock the screen. Click and drag a bounding box on the color/object to be tracked. Make sure to have the bounding box contain mainly the color of the object and little to none of the background. Click on one of the seven 'Set' checkboxes to assign that color to a signature slot. Click on the double-sided arrow icon to the right of the 'Clear' button and use the slider to calibrate the Vision Sensor to best detect the color signature. For best results, drag the slider until most of the colored object is highlighted while the background and other objects are not. Press the Freeze button once more to allow the Vision Sensor to resume tracking. Move the colored object within the field of view of the Vision Sensor to ensure that it is being tracked. If the tracking is working as intended, close out of the Vision Utility. NOTE: To configure the Vision Sensor to detect more colors, repeat steps 4-8. NOTE: The Vision Sensor is sensitive to different levels of light. The color signatures might need to be re-calibrated if the levels of light in the robot's environment change.